December is a special month for family skiing. Not only does it mark the start of the ski season, but also the opportunity to ski over Christmas as well as into the New Year. Each week of this month brings its own unique advantages, giving you the chance to find the week that suits your family. Whichever date you choose, December has the buzz of the festive season! Whether you’re an avid fan of skiing already or a ‘newbie’ getting a feel for the slopes, gliding through the snow after patiently waiting all summer long is a treat you won’t want to miss! One thing is certain, you will be the envy of all of your friends as you’ll be the first to conquer the slopes! Anticipation is in the air for the season ahead in December. You are sure to be caught up in the early-season enthusiasm of our seasonnaire staff and being among the first on the fresh snow. As soon as the snow blankets every inch of France’s once-green mountains, ski resorts across the Alps open their doors to welcome eager adventurers. The start of the ski season in France (and other destinations in Europe) typically begins in mid-December (we open on 15th December for the 2018/19 season). 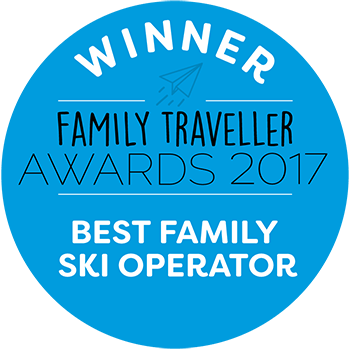 If you exclude the skiing weeks of Christmas and New Year, December is generally an affordable time for families to ski. Lift passes are usually great value and our chalets are at our lower ‘Allez’ pricing. 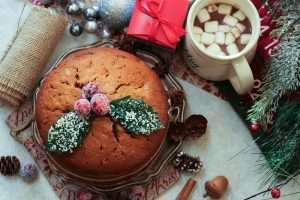 Many families are looking to experience a ‘White Christmas’ or enjoy the festivities over New Year, making skiing ‘pre-Christmas’ a little less popular and therefore very well-priced. You’ll also find that our resorts tend to be a little quieter during this period too. Not only this but you won’t have to worry about long queues for the chair lifts or waiting for a seat at your favourite mountain restaurant. This time of year also appeals to those who like the idea of skiing ‘pre-Christmas’ to get them into the festive spirit, before returning to enjoy Christmas Day at home with the family. Our family ski resorts are still wonderfully decorated for Christmas by this week, and it is often a good-value time to take the family away on holiday. Many private schools break up by this point too and so makes for a more cost-effective option compared to the following week in which Christmas falls. Some families may be put off by a potential lack of snowfall, however if last season’s snowfall is anything to go by, then you can expect plenty of snow in early/mid-December. In fact, if Mother Nature blesses us with a massive dump of snow once again, you could be one of the first skiers to enjoy the fresh, untouched snow. Any seasoned skier will recognise how precious this can be! 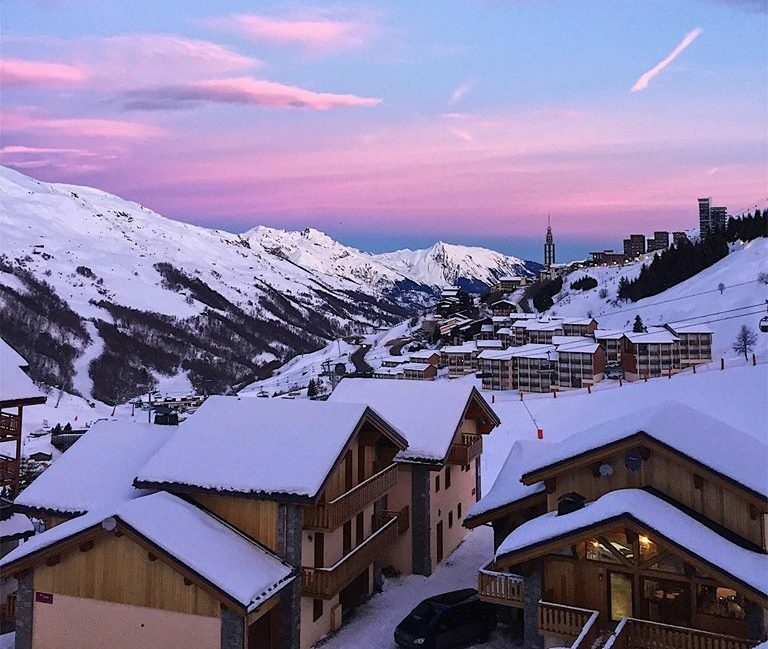 Resorts at high altitude tend to be more snow-sure at the start of the season, such as our resorts of La Plagne (1800m) and our two resorts in the 3 Valleys – Les Bruyeres (1850m) and Reberty (2000m). Our other resort, Les Gets, is lower (1200m) however last season it experienced plenty of early-season snow and has already received snow in October this year – 2 months before the season starts! On the off-chance that there is a lack of snow in Les Gets, rest assured, we will organise a shuttle service to nearby Avoriaz where you can ski. It goes without saying that skiing in the week of Christmas is a truly magical experience. To really make this a memorable occasion, we recommend bringing extended family with you (such as your grandparents) and booking a whole chalet just for yourselves. Christmas Day does not mean the resort shuts down. In fact, there’s nothing better than breaking with tradition and spending this dreamy day on the slopes. Wake up on Christmas morning and head out for a morning ski, safe in the knowledge that you’re not the one cooking the turkey (or doing the washing up) this year! 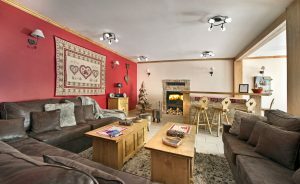 Our fully-staffed chalets are beautifully decorated with a real Christmas tree and many have a cosy log fire and a delicious traditional Christmas dinner served by your chalet hosts. We like to think of your Christmas ski as a great way to build up your appetite for your festive food. Once you return to your chalet, simply cosy up by the fireplace ready for gift giving, family time and leave the Christmas cooking to your chalet staff. Main: Traditional Roast Turkey with Bacon, Apricot and Sage Stuffing. Roast Potatoes, Honey-Glazed Parsnips & Carrots, Brussel Sprouts with Chestnuts and Bacon. To add to the excitement, Father Christmas will personally deliver your child’s present to your chalet. In Les Gets you can even go and meet him in his log cabin in the Enchanted Forest. Each resort will host a range of events and activities to get you into the spirit. The resort of Les Gets really comes into its own at Christmas. Steeped in traditional Savoyard charm, the picturesque Alpine village is adorned with festive lights; everyone really pulls out the stops to create a truly magical environment. 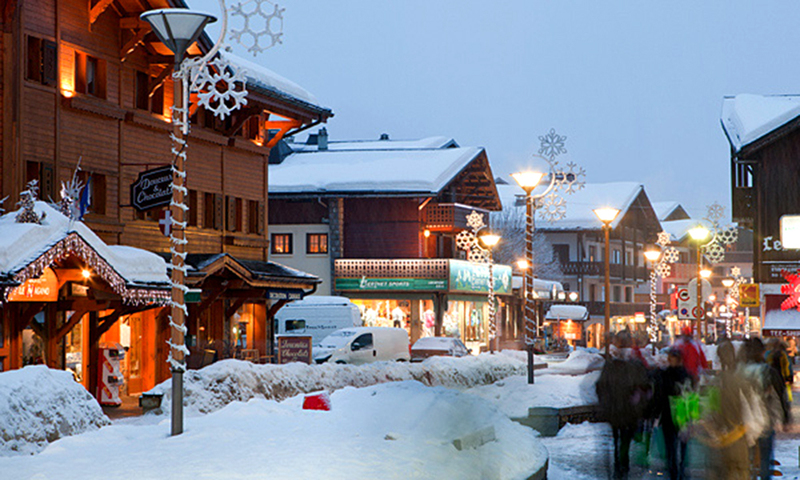 The resort of La Plagne is traditionally marked with a carol concert outside the Tourist Office in Plagne Centre on Christmas Eve along with a visit from Father Christmas before he sets off to begin his work on the most magical night of the year. Christmas Mass services are also held all evening in the Church in the centre of the town. Christmas in our traditional Les Bruyeres and Reberty 2000 hamlets (in the 3 Valleys) offer a restful and picturesque retreat from bustling Les Menuires, yet the centre is easily accessible by both bus and the piste, meaning you can make the most of the Christmas festivities that take place. Christmas in Les Menuires entails children’s shows and entertainment, carol concerts, and Christmas trees adorned with tinsel lining the village streets. The torchlight descent also takes place here on Christmas Eve each year. 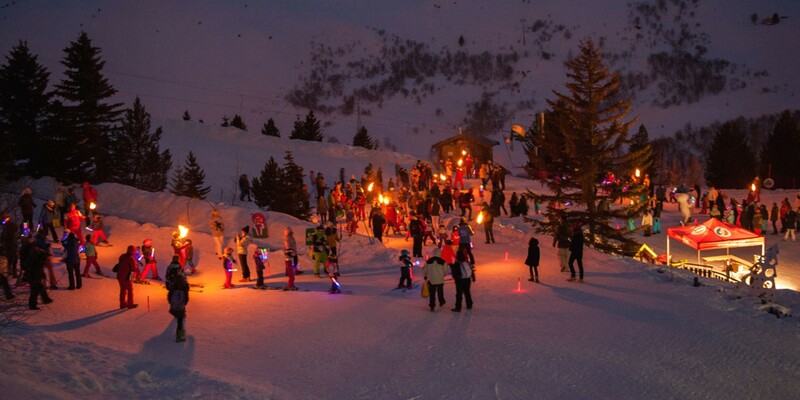 Organised by the French ski school, instructors along with Santa and his elves ski down the piste with flaming torches in hand, creating a line of fire that weaves into town. This is followed by a spectacular firework display and complimentary Vin Chaud, making it an evening to remember for all the family. For this 2018/19 season, 22nd December marks the start of the Christmas week. This is a popular week to ski so we suggest to book early if you want to secure your favourite chalet and preferred choice of room. The Christmas period has come to an end, you’ve eaten too much, you’ve seen slightly more than enough of your relatives and a change in scenery is long overdue. This is the perfect time to get the suitcases out the loft, pack up the Christmas toys that still have working batteries and head out to the mountains. New Year is a great time to enjoy fun family time and a superb service in the beautiful scenery of the French Alps. All of our family focussed resorts host a multitude of events and activities that enable you to prolong that holiday feeling all the way through to the end of the first week of January – forget all about the January blues this year! New Year is a memorable time for families and we pull out all the stops to make it go off with a bang. The atmosphere is simply wonderful. Take it from us, there really is no better way to see in 2019 than sipping champagne next to a roaring fire surrounded by family and friends. Settle down to a spectacular 3-course evening meal, specially created for our New Year’s guests before taking advantage of our childcare service and heading out to enjoy the celebrations taking place across the many bars and restaurants in your resort. Finish the night off with a spectacular firework display before taking on that red run first thing on New Year’s morning. La Plagne has it all when it comes to your New Year break. The lights are still shining from Christmas and the feeling of celebration is still very much in the air. Explore the vast Paradiski ski area by day, and enjoy the host of festivities on offer by night. New Year in La Plagne sees hoards of merry revellers head out to the centre of the town for the big countdown before the stroke of midnight detonates champagne corks and fireworks, signalling the start of the celebrations. 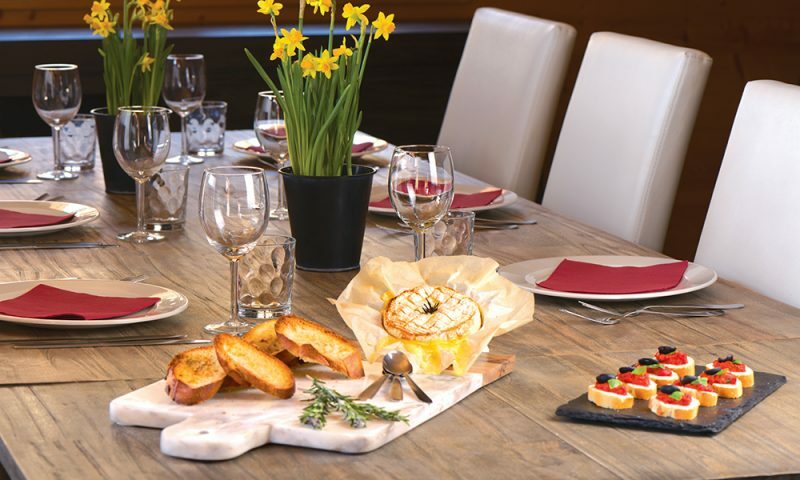 If you’d prefer a more relaxed start to 2019, stay back in your chalet and toast in the New Year with family before being first out on the slopes in the morning. Learn more about La Plagne at New Year through the official La Plagne tourist board website. 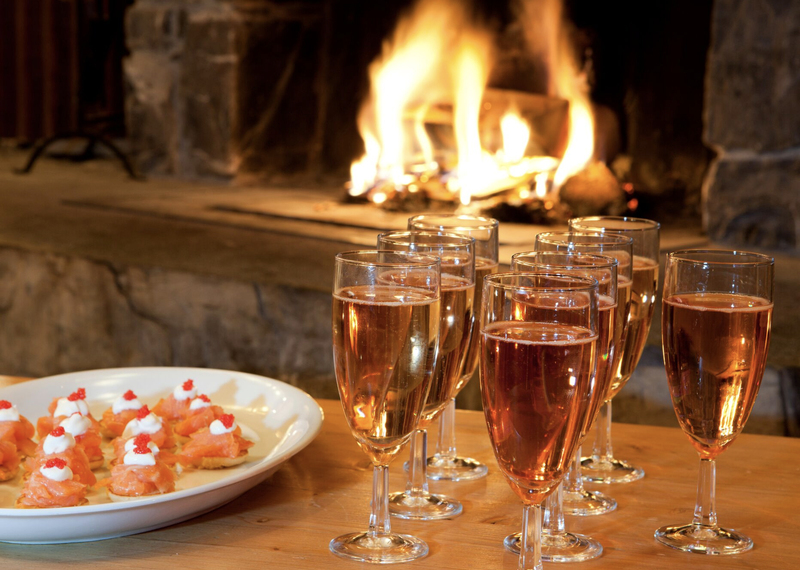 Why not book out our entire Chalet Nicole for a New Year to remember? Sleeping up to 30, it is the perfect base to get everyone together for the New Year celebrations. 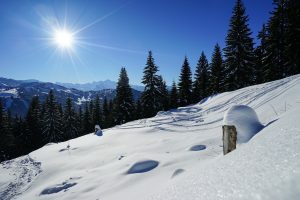 New Year in Les Gets is just as magical as Christmas with the festivities running straight through to New Year’s day. 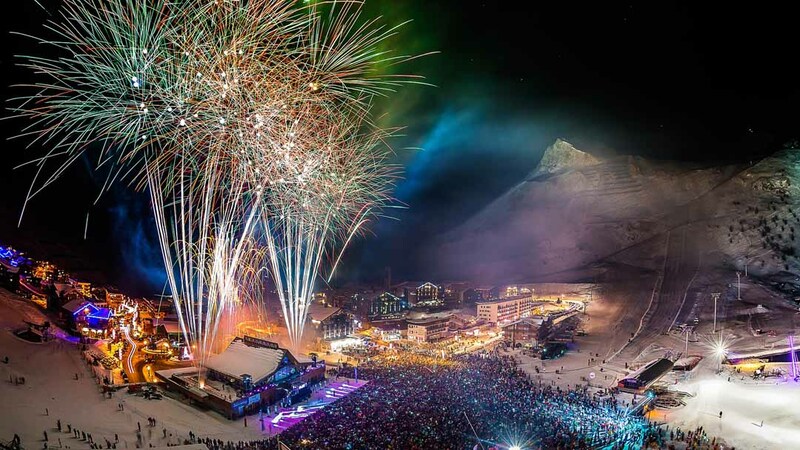 As with the other resorts, New Year’s Eve sees a stunning firework display light up the skies above the snow-topped mountains and there are plenty of bars and restaurants open in the village. 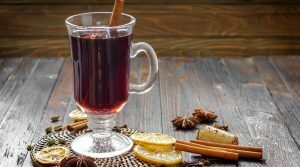 Being such a family-orientated resort, New Year here is geared very much towards the children, with a torchlit display and complimentary mulled wine and hot chocolate on offer. Those visiting our Reberty and Les Bruyeres chalets over New Year are no exception when it comes to experiencing the true alpine celebration. Similar to Les Gets, guests are treated to a spectacular torchlit descent by the local ESF ski school instructors ending at the Croisette snow front. This is complemented by an evening of live music and entertainment complete with free mulled wine and nibbles. A free bus service is also put on to transport those staying in Les Bruyeres and Reberty down to the celebrations, which run late into the night. New Year’s Eve culminates in a fireworks display accompanied by a DJ set before you head back to your warm chalet for a good night’s sleep. Get up bright and early and start how you mean to go on by enjoying your first ski of the new year. If you’ve enjoyed one too many Christmas puddings and your New Year’s resolution is to shed the pounds, Chalet Eva in Reberty 2000 (3 Valleys) might be just the place to go. On top of all of the skiing you’ll be doing, the chalet now has its own fitness area – new for the 2018/19 season. Main: Beef Fillet and Mushroom Cream, Pommes Duchesse & Haricots Verts. Vegetarian: Tian of Mushroom Cream, Pommes Duchesse & Haricots Verts. If skiing in December appeals to you, please do get in contact with our friendly team on 01252 365 495 who can guide you through your options.